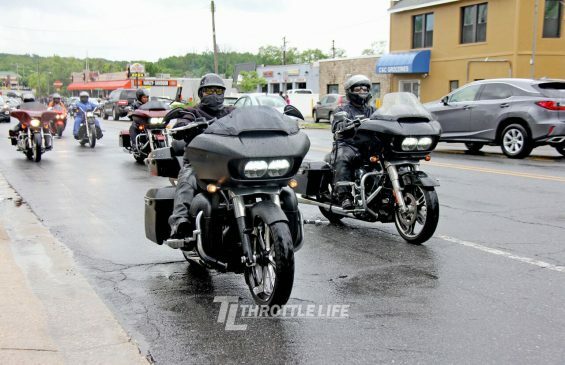 Bessie Stringfield All Female Ride – DMV Pep Rally | Throttle Life! It was dreary rainy Saturday May morning in the DMV as the clouds cast a gray lull throughout streets. 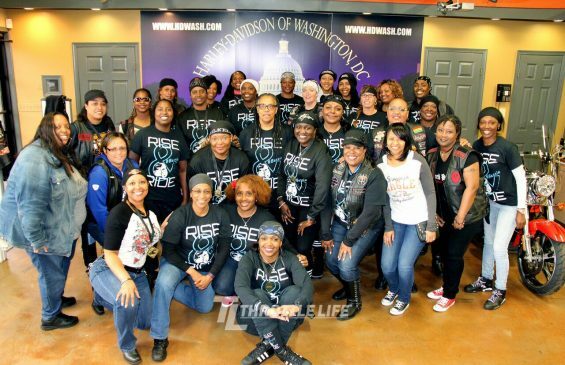 However, within Harley-Davidson of Washington, the vibe was anything but gloomy for the Bessie Stringfield All Female Ride, the DMV Pep Rally hosted by the Ladies of the ‘O’MENS MC Fort Washington Chapter by First Lady, the motivating Shorty Rock. The day consistent of music by the “Unforgettable Diva” on the mic and turntables, vendors, free food, guest speakers and a police escorted ride. Yes, a ride throughout the DMV even with the rain. Although safety was paramount, the ladies weren’t going to let a little rain get in their way of doing what they do. It was simply time to gear-up, mount up and go! 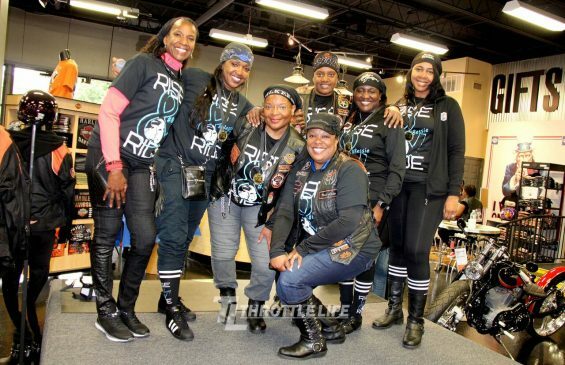 But before they ride, the ladies gathered for a welcoming prayer by ‘O’MENS MC Baby Girl followed by a presentation on the background, history and purpose of this nationwide celebration by the rides’ dynamic founder Kurvez. Not only did Kurvez passionately provide knowledge and enlightenment on the inspiring Ms. Bessie Stringfield, she also graciously took time to acknowledge and thank her team in attendance including Fiesti of the infamous annual All Female ride that took place during the Atlantic Beach Bike Fest, Jus’Tis, and Silkee to name a few. Kurvez poetically ended the presentation with “There’s a little of Bessie in all of us.” which set off a wave of applause. Guest speakers included Peppa with Platinum Dreams MC who spoke from first-hand experience on the importance of maintaining your bike with performing your own safety checks each and every time before you take to the road. Jus’Tis kept the audience’s attention with her expertise and knowledge of securing your weapon properly when traveling while Redi Red had the crowd captivated with her time and ultra-space saving compact travel tips with dropping some grandmotherly advice to stay ready so you don’t have to get ready. Taking to the stage in his usual cool fashion was Gerald of Gerald’s Auto Detail shop who spoke on the value of maintaining your bike mechanically as well as cosmetically. “A good detail job goes a long way to not only keep your bike clean, but more importantly to truly protect it from debris, bugs and the usual flying road hazards we face on the road.” he said with sharing a costly example from a customer who unfortunately learned this lesson the hard way. 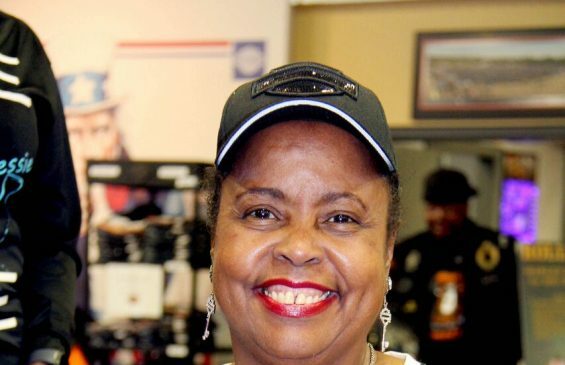 But it was Ms. Wanda that had the ladies in tears with laughter and in awe as she shared her 40+ plus year of riding experience from her days being one of only a few women that rode to still riding today with a bad knee and all and plans to keep riding until she can’t ride anymore. Its’ no wonder with an attitude and outlook like this that “Wicked Wanda” earned the Bessie Stringfield Lifetime Achievement Award. If you haven’t done so, mark your calendar for the 4th Annual Bessie Stringfield ALL Female Ride finale in Killeen, Texas June 21st thru Sunday June 25th and watch and learn as the ladies show how it’s done.